Have you analyzed what would be a fair discount from NAV for FFP? I.E: considering taxes paid from the dividends received and the company cost structure. The dividend yield is only 2,56%. Holding until the end of time does not sound very attractive alternative with that dividend? I don’t think taxes and corporate overhead at the holding company level are good explanations for the discount. Haven’t done a in-depth analysis, but G&A expenses seem to be ~1 million annualized (that’s fine for a hold co with >2 billion in assets) and France seems to be an excellent country tax wise for a holding company, see for example this article. So a more normal holdco discount of lets say 15/20% seems appropriate to me. I think the big discount is mostly the result of the ownership structure of the company: the family is a controlling shareholder, and the free float is small. PS. The current dividend yield is actually zero! Ok. I checked the dividend yield from Financial Times. Haven’t done any real work on this one, yet. About the dividend yield: it’s not about what they pay today, what they could pay, and what they will pay 3, 5 or 10 years from now. If you buy assets at a 50% discount you obviously also buy something that can support a yield that is twice as high as the underlying assets (minus overhead expenses). The intrinsic value is here, and some day that will be recognized and/or realized: that’s what I’m betting on. Any idea what the range of the discount is historically? Thanks! Only checked a couple of data points, but it seems that it has almost always been high, but often lower than the current 50%. As I have been looking at FFP for quite some time now, I am still very tempted to buy FFP given this discount of around 50% versus NAV. 1. Since a large part of its NAV is listed, we can simply look at the valuation of the underlying shares. Zodiac is trading at a (forward looking !) P/E of 17, LISI at 13, Orpea 16, SEB at 14 and DKSH at 21. My main concern is that these companies are not cheap. Further since Peugeot has rallied significantly, would that mean that the upside in NAV might be limited. 2. Since the company always traded at a large discount, therefore I think the upside might be limited. Let’s say the discount narrows to 40% (which is historical has been a low discount), than your return is 10% over the period that the discount rate narrowed. This could be some years. 3. By the way, currently around 80% of the company is in the hands of the Peugeot family. It is not in their interested to close the discount. It is nice on paper for them, but in the case they won’t be selling any of its shares there is no benefit for them (i.e. probably they would have to pay more taxes on it !). When the discount is huge, it is in their interest to potentially, someday, buy out the minorities (which is cheaper when the discount is higher) – at a small premium (but this could takes years). 3. All in all, I guess the main driver of return would (still) be an increase in NAV and some upside from a potential lowering of the discount. To me your focus is a lot on the discount and not on the underlying increase of the NAV. I am interested in hearing your thoughts on that ! It’s important to realize that a discount reduction of 10 percent implies a 20 percent return! There is a significant amount of upside possible the discount shrinks to 30% or less, and this is in addition to the return that will be realized on the underlying assets. If you have a strong (negative) opinion on the underlying assets this is obviously not a good investment, although at a 50% discount you do have some margin for error. Agree that the return will be 20 percent with a rduction of the discount by 10 percent. Do you see a lot of upside then on the underlying stocks ? Do I need have to have an opinion? I wouldn’t necessarily expect high returns from the underlying stocks, but also don’t expect low returns. You basically get a bunch of good businesses that aren’t cheap, but also not extremely expensive, and you get Peugeot that is cheap, but also risky. And it’s in France were the economy isn’t doing that well: maybe things will turn around, maybe not… who knows. One other skeptical point I will make from my experience investing in undervalued companies that have large management shareholders: What I have occasionally seen is that these large holders have no interest in closing the valuation gap or returning capital through dividends. This is because although their interests are ostensibly “aligned” with the minority holders they have the benefit of running the company and can treat it like their own piggy bank by putting their personal day to day expenses through the company (cars, rent, travel, property etc). I note your comment above that G&A only appears to be EUR1m p.a. but I am not sure how much visibility there is on this (especially as I do not speak French so cannot read the filings in detail). Sorry, missed a zero in my comments about the expenses. They are 10 million, or 0.5% of NAV. I think this is potentially overstated because there might be something consolidated in that number, but just like you I do not speak French. but Google Translate is pretty good. And one thing to note is that this is a holding company, not an operating company, so usually expenses are reasonable limited. How old are the family members? Are they retiring soon? Discounts fluctuate: I don’t think you necessarily need a hard catalyst for a change. This is IMO just like CEF discounts: sometimes they are big when investors are pessimistic, and sometimes they are small (or negative) when investors are euphoric. I’m simply (trying!) to buy cheap, hoping that I’ll be able to sell it less cheap at some point in the future, and I’m a patient person: I don’t mind waiting a couple of years or even more! So the sole difference with Urbana here is the lack of corporate overhead? How do they account for these cross holdings? 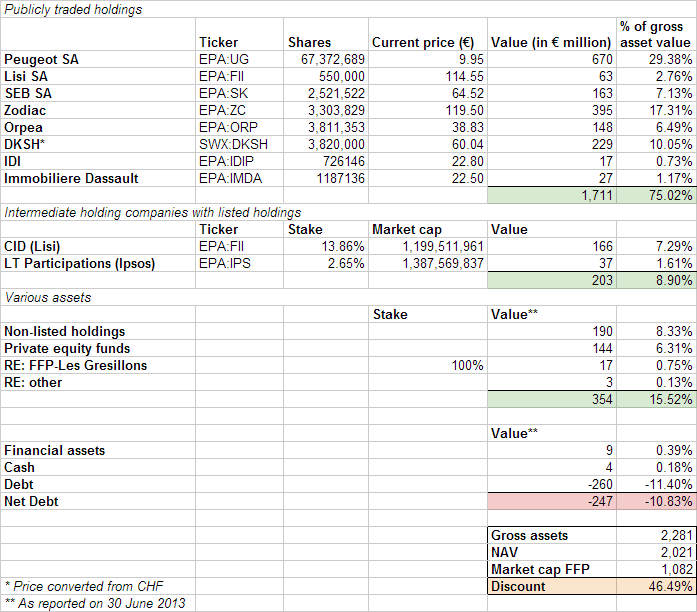 If it’s equity method, what are the values of these holdings on their balance sheet? Why do they hold these assets, and do you think the management has any incentive to monetize the holdings? I’d say that how they account for their holdings on the balance sheet is totally irrelevant. What matters are current market prices! But to answer your question: most of it is accounted for using the equity method, and you should check the latest financial report for the precise book values. And why do they hold these assets? The Peugeot family founded Peugeot, so that’s the family legacy. The other assets are part of the ‘diversification’ portfolio, presumably they realized that betting everything on Peugeot wasn’t the best plan from a risk management perspective. If the discount has been there since ’07, I don’t see why they should all of a sudden they should care about the market price. These guys are business owners and understand that the “market” can be irrational and miss-price assets. Unless there’s a catalyst (transfer of wealth from generation to generation, change in management, etc.) the discount is likely to continue to present itself in the stock price… An object in motion stays in motion. Did you check if this assumption is really true? As a shareholder at Burelle (same hope, of reducing discount) I realized quite wondered, that the dividend of Burelle is MUCH smaller than the inflowing dividends from Plastic Omnium. 3. The holding may think that they know better investments than pay high dividend. PS: Nevertheless Burelle was among my best investments this year, due to the fantastic development of the PO-share. Even if the dividends are discouraging. What is the OTC ticker symbol, if there is one?